Garnier Nutritioniste Skin Renew Anti-Dark Circle Roller – While technically not a concealer, the Garnier Anti-Dark Circle Roller is tinted so it provides some coverage. 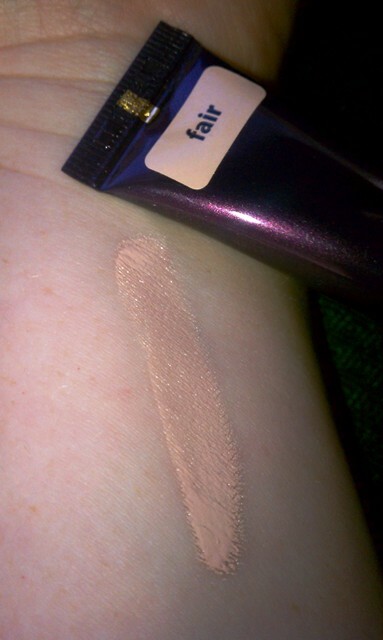 I was worried about it matching my skin because it’s a one-shade-fits-all product but it’s actually somewhat peachy so it helps counteract blueness under the eye and it’s sheer enough that you can easily blend it in to match your skin. On darker skin, I imagine it would have a pretty, brightening effect actually. I use it everyday – either as a base for an actual concealer or in place of concealer when I’m going for a quick, casual look. Maybelline Instant Age Rewind Eraser- Dark Circles Treatment Concealer in Fair – The Maybelline Instant Age Rewind Concealer reminds me a lot of the Garnier Dark Circle Roller. 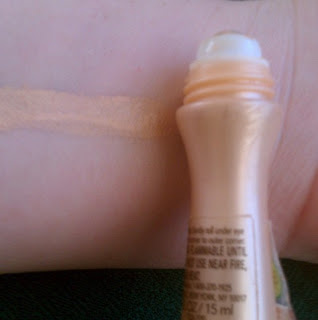 It’s very lightweight, almost liquid-y, and has a peachy color that helps hide blue discoloration. 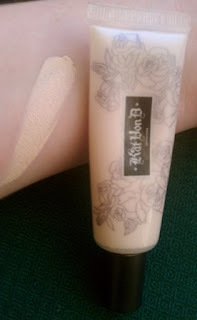 On me, it has a very moisturizing and brightening effect under the eyes, so it never looks cakey or heavy. Bobbi Brown Corrector in Porcelain Peach – This product is a corrector, which means it’s intended to cancel out the blue under your eyes but not necessarily match your skintone. In other words, you may need to layer another concealer on top of it to help it blend in. I can actually get away without putting a concealer over this corrector if I’m feeling lazy, but I do layer usually another concealer over it. I have to be sure to use a lightweight formula, though, because I can get a cakey look if I use concealer that’s too heavy since the Bobbi Brown Corrector is fairly thick and creamy itself. Tarte Maracuja Creaseless Concealer in Fair – I don’t think I could use this concealer to hide acne or blemishes on the face because the shade is just too peach-toned. However, it works beautifully under the eyes. It’s extremely concentrated so you need the smallest dab to cover dark circles, but it gives a really gorgeous, brightening look. I can’t say that it never creases – at the end of a long day, I’ve found a few – but it does seem to hold up better than other concealers under the eye. The maracuja oil gives it a nice moisturizing feel too. 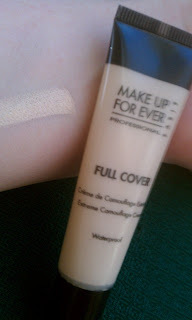 Makeup Forever Full Cover Concealer in Shade 2 – Full Cover is right! This stuff can hide just about anything, dark circles included. I have used this one on the rest of my face as well, and I think it works well for redness and scars too. 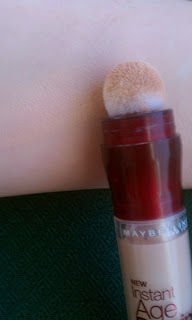 Like the Tarte concealer, a little of this goes a long way so it’s easy to get a cakey look if you use too much. Kat Von D Tattoo Concealer in Porcelain – I’m not sure I believe that this concealer could actually cover a tattoo (Mine’s on the back of my shoulder, so I can’t really test it out) but it covers everything on my face that I need it too. 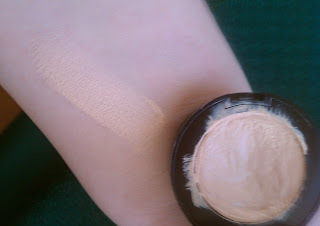 This is actually one of the lightest concealers I’ve ever found – it’s a bit lighter than the Makeup Forever actually. 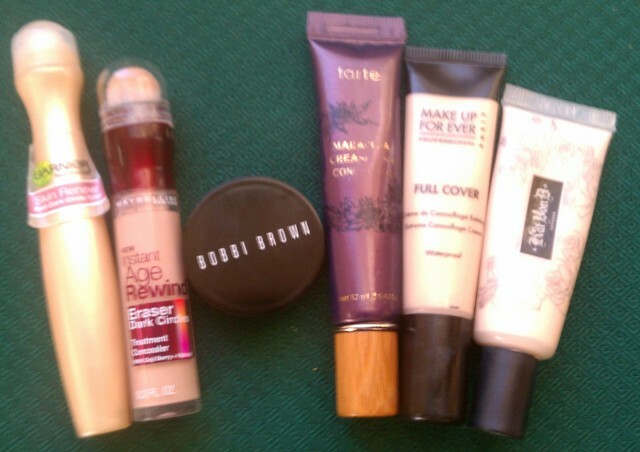 Like the Makeup Forever and Tarte concealers, you don’t need much of this stuff to get the job done. I use it mainly under my eyes, and it can sometimes crease or look a little cakey if I don’t moisturize enough beforehand. What are favorite concealers? Do you have favorites for different jobs, i.e. under the eyes vs. acne? What do you look for in a good concealer?